I tend to eat a lot of warm foods in the winter time. Winter just seems to loan itself well to soups, stews, and ragouts. The following is a modified version of one of my favorite recipes. 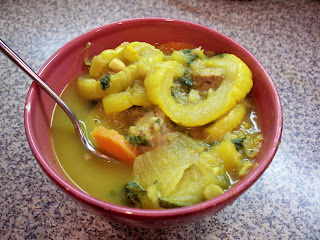 It combines lots of veggies with two of my favorite spices: saffron and curry! I made this while housesitting and just threw it together with what veggies were fresh on hand along with some from the freezer. 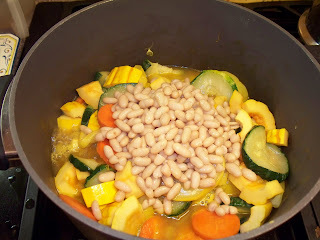 Stews like this one can change throughout the year to reflect whatever veggies are in season. In a large stock pot, heat olive oil over medium to medium-high heat. Once the oil coats the bottom of the pot add in the saffron threads. Adding heat to the threads releases their flavor. Add several healthy shakes of curry powder. Add chopped onion and garlic. Cook until onion is translucent. 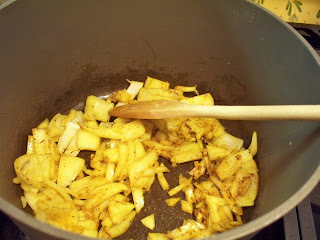 The curry and saffron will coat the onion and garlic and make your stew taste delicious! Begin adding in your vegetables one at a time. First I added my carrots and then stirred them all together so the curry/saffron mix coated them. Then I added my different squashes (I used 3 different types: delicata, yellow, and zucchini) and stirred the mix all together. Then I added my white beans on top and stirred together. 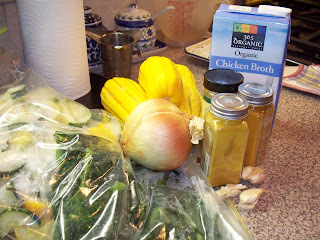 Pour the chicken broth over the veggies mix. Bring to a boil. Once boiling, reduce heat to medium-low and simmer for at least 30 minutes. You can simmer for up to 2 hours, but if you intend to simmer for this long, please turn heat down to low. While the soup is simmering it’s time to cook up our chicken sausage. I buy the package of 4 links and am really fond of the chicken and apple sausages because they add great flavor to this particular recipe. Most chicken sausage links are already pre-cooked but we want to sear the sides and warm up the sausage. In a small to medium sized skillet, heat the sausage over medium heat until seared and warm. Then add it to the simmering stew! Toward the end of your simmering period add in the spinach and kale (or whatever greens you’d like to use). I remove the stems and either roughly chop these or rip them into pieces by hand. Once everything is nice and warm it’s ready to be scarfed! 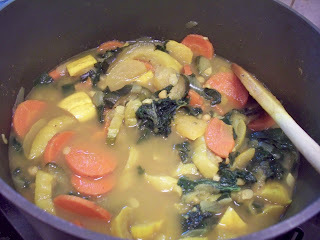 carrots, chicken, curry, kale, onions, saffron, spinach, squash, stews/soups, vegetables. Bookmark the permalink. Post a comment or leave a trackback: Trackback URL.